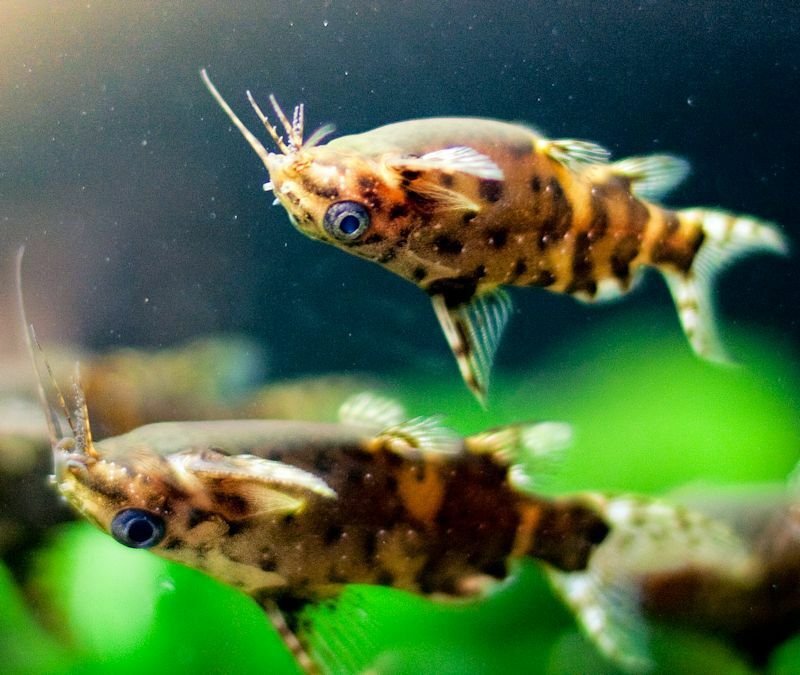 One of the smallest members of the Synodontis species, the upside-down catfish is aptly named for its upside down swimming posture, which makes it easier for it to feed more effortlessly on the water's surface. It is also known as the blotched upside-down catfish because of its spotted appearance. They are an extremely popular species that apparently have been admired for countless centuries. Their images have been found in ancient Egyptian art. This fish can be found in Central Africa in the Congo Basin and Cameroon. It inhabits densely vegetated areas of riverbanks. Considered a dwarf catfish, they reach an adult size of only three to four inches. Like other members of the Mochikidae family, they have large eyes, a large adipose fin, a forked tail, and three pairs of barbels. Their light brown colored body is covered with dark brown blotches of various sizes. These fish are adapted to spend most of their time upside-down. The underside of the body has a darker hue, which is the opposite of fish that swim with their belly downwards. This reverse coloration serves to camouflage them when they swim upside down at the surface of the water. Although, they swim faster when upside down, don't be surprised if they swim normally for periods of time. This is particularly true when they want to graze the bottom of the tank for morsels of food. Upon closer examination of the inner structures of this catfish, scientists found that its swim bladder was normal and there was nothing unusual about the balancing organ of the ear, as it resembles that of other catfish. Like other catfish, they have sharp fin spines that can cause injuries when moving them. Take care when netting or moving these fish. Use a very fine mesh net while moving or catching this fish. They are good community fish. A peaceful species, upside-down catfish can be combined with other peaceful species successfully. Despite its peaceful side, it is a carnivore and will eat very small fish. Do not keep this fish with other fish that are large enough to attempt eating it. It will erect its spines and become lodged in the eater's throat. Do not house this catfish with aggressive fish. The most appropriate tankmates include African tetras, dwarf cichlids, such as pelvicachromis or anomalochromis, and small elephantfish. It is best kept in small schools. This species should be maintained in a group of at least three to four, which will give them confidence and encourage them to come out of hiding. Well suited to the aquarium environment, the upside down catfish is easy to care for. Water should be moderately soft and slightly acidic to neutral. Aquarium temperature is not critical. Sensitive to nitrates, good water conditions are necessary. This catfish typically requires water that is well-oxygenated. Frequent partial water changes are needed to keep them healthy. It prefers a relatively strong current. This can be achieved by using powerheads or a spray bar water return attachment on a canister filter. Provide hiding places situated in areas of heavy current for shelter. A well-planted tank is ideal, preferably using broad-leafed plants, as they like to browse the undersides of leaves. Driftwood, rock arches, and rockwork decorations are appropriate. Caves that provide places to hide are recommended. It is quite normal for this fish to hang out on the underside of rocks, leaves, and driftwood. Like most catfish, it tends to hide during the day and become active at night and the dusk hours, so adequate hiding spaces must be provided. Use a "moonlight" lighting fixture to view their night activities. In nature, the upside-down catfish feeds primarily on insects at the surface of the water, and it often grazes on the undersides of submerged branches and logs. Swimming upside-down makes these areas more accessible. They will also graze on algae to supplement their diet. You can also feed it vegetable matter in the form of shelled peas and cucumber. Females are larger, paler in coloration, and have a plumper more rounded body, particularly when ready to spawn. Only a limited number of successful spawnings have occurred in an aquarium. Upside-down catfish prefer cave spawning. Offer an overturned clay flower pot or two or even some PVC pipe as a possible spawning location. Condition the breeders with live foods. Soften the water and use a sprinkler to add colder water to the tank, mimicking spring rains, to increase your odds for successful breeding. Eggs will generally be laid on the roof of the cave. Up to 450 eggs may be laid. Parents may be left in the tank after spawning, as they will tend to the brood. The eggs hatch in approximately two to three days and the fry will feed off the yolk sac, which they carry for four days. Once the yolk sac has been consumed, they will begin eating freshly hatched brine shrimp. They initially swim in the upright position before moving to the typical inverted position. After two months, the fry will begin swimming in the characteristic upside-down way.